Caramelized Peach Custard Tarte Tatin is a combination of sticky caramel, sweet peaches, delicious pastry cream topped on a crisp buttery pastry base. This tart is so delicious that I’ve made it twice this month. 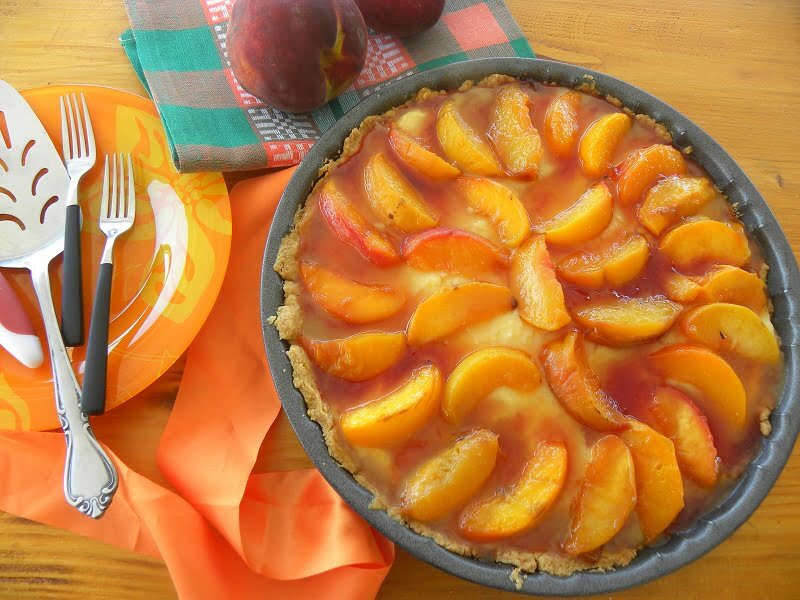 Instead of peaches, you can use, as a topping, any other stone fruit, such as apricots, prunes, plums, cherries etc., and when the summer is over, you can make it with apples and later on with quince. This month marked my 11th blog anniversary. Never, in my wildest dreams did I believe that I would be blogging for so many years. My favourite hobby became a passion and eventually into a profession I would have never thought possible 11 years ago. However, blogging is getting much more difficult each year as my blogging time is running short but I am not giving up yet. I may not be concise with my blogging duties, due to lack of time, as my work starts early in Spring until late in Fall but the busiest time is mostly during the summer. Needless to say that there is no time for summer vacation and when we have some free time, my husband and I go to the beach whenever we can. My children came and visited us early in Augut, so we did not plan any cooking classes in order to spend some time with them. This is when I made this tart for the first time and my children loved it. I started preparing this post a couple of weeks ago but as you may see, I strive to add a recipe a month, as it is very difficult when working and with all the distractions around us. However, it’s not that I have totally neglected my blog. Each day, I work at least 5 – 6 hours, either early in the morning or late in the evening, to update some of my older posts, by putting the old recipes in my new recipe plugin called Create by Mediavine, which is still on Beta test, so this is also taking some of my time. When doing this I also update the text, add new photos, or even add the old photos again, without the watermark and properly updating them for SEO purposes, which we had no idea back then! When I was going through my old posts to find my past anniversary posts, I was amazed to see and remember that during the first years of blogging I posted one recipe a day!!!! “O tempora o mores” photo credit Wikipedia. Making homemade tart crust may seem scary to many people, so when making the tart, I had time to take some videos of the whole procedure, which will definitely help you to prepare it. The pie crust is blind baked with some weights on it (I used beans), so that the tart shell does not rise or shrink. The procedure is fully explained in my post for Pâte Brisée, so I have added the video in that post. In the recipe I chose to make some Pastry Cream to use as a filling. Again the video was posted in that recipe. I chose pastry cream because I hate planning ahead, so when I decide to create a recipe, I work with ingredients which I have at home and the pastry cream ingredients are always available at my house. However, you can make the filling using cream cheese and Greek yoghurt or anthotyro and yoghurt or even use a galaktoboureko filling with semolina and fresh milk (or with condensed sweetened milk). As my basic pastry cream recipe is a large quantity, which I usually use as a filling for cakes, profiteroles, eclairs, millefeuilles, etc., I also posted the smaller dose of the cream I made for this tart. While the cream is cooling, add some cling film on top of the pastry cream in order to avoid skin forming on top. The second time I made the recipe, I whipped some heavy cream with icing sugar and vanilla. When the pastry cream cooled completely, I added half of the whipped cream and fluffed it up, using a hand mixer. The remaining whipped cream was used to decorate the tart. By adding the whipped cream in the pastry cream, it makes the filling light and airy. This cream is also callled Diplomat cream or Bavarois, with the addition of gelatin, so that it sets. I decided to make the tart one day when I realized that the previous week, we bought too many fruit from the farmers’market, and the peaches were already too ripe. The peaches which were getting very ripe, had to be used immediately. I know I could make jam but then there is always an abbundance of jams in my closet, as I still have mandarin marmalade made during the winter, mulberry jam made during spring, prune jam (not posted yet), made from fruit picked from our own trees, apricot jam made early in June etc. So my other choice was to either make an upside down peach cake or a peach tart. The peaches were of medium size and after being washed, each peach, was cut into about 8 slices. I put them in a non-stick frying pan, added some butter and sugar and cooked them until the sugar became into a thick syrup. After removing the pie crust from the oven, I spread the cream on top and added the peaches into a circular motif. The leftover syrup was cooked again for about five minutes, until it caramelized. By caramelizing the syrup it will take your baked goods to another level of flavorfulness. The tart is decorated with the whipped cream after the sauce cools. Prepare the pie crust. See video with detailed instructions. Refrigerate pie crust for half an hour. Roll out and place in a buttered tart pan. Refrigerate again. Add parchment paper and weight and bake for 20 minutes. Cut the peaches in slices and put them in a non-stick frying pan, together with the sugar and butter. Bring to a boil and mix on high heat and cook for about fifteen minutes, or until the sugar caramelizes. Set aside. See video with detailed instructions. Add half of the whipped cream and mix it in using the hand mixer. Spread the pastry cream across the tart shell. Arrange the baked peach slices in a pattern over the pastry cream. Put the leftover syrup back on the heat and boil for 5 minutes until it reduces and becomes thick caramel. Decorate with the whipped cream.